For people who are feeling 'not quite right' with themselves and are just a little out of balance. An excellent Essence for people not sure of what it is they are feeling. It is great for worry and distress. It is for those who always have something to worry about without having specific fears. 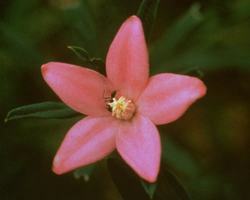 This purple flower has five petals with a prominent raised centre. Five in numerology relates to the emotional centre and the integration of emotions.